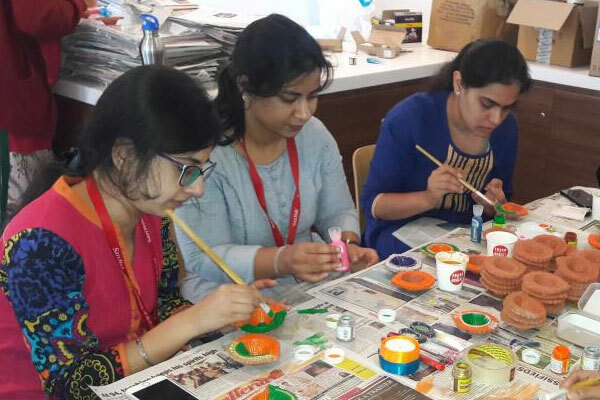 As Diwali - the festival of lights gets closer, SanDisk employees in Bengaluru decided to celebrate the festivity with Akshaya Patra beneficiaries. On October 4, 2016, over 50 employees from SanDisk, Bengaluru, India took time off from work to paint lamps (diyas) as a Diwali gift for Akshaya Patra’s beneficiaries from Government Higher Primary School, Vajarahalli, Bengaluru. The school staff, along with Akshaya Patra employees, distributed the lamps to all the students.